Vintage educational animation from Bray Studios (Colonel Heeza Liar, Krazy Kat), detailing the working of respiration in cellular organisms. Courtesy of the Prelinger Archive. A sequel of sorts to Free Radicals (1958), Lye’s last completed film was made by scratching directly on black film leader. Set to the rhythms of African drumming, its tornado-like vortices and insectoid swarms create the illusion of depth through their infectious movement. All Over is a cameraless film. The dots and streaks that fly across the screen in a candy-colored assault on the spectator were produced by dripping the black film leader in various acids, sod, and bleach. Another spectacular effort by one of France’s masters in the skilled destruction of celluloid. A most unusual work by Menken—best remembered as a pioneer of the lyrical and diaristic modes of avant-garde filmmaking—Hurry! Hurry! layers micrographic footage of spermatozoa with the dancing rhythms of fire, while the soundtrack is culled from a stock recording of aerial bombardments. Brakhage speculated that a lone and struggling spermatozoon could be read as a stand-in for Menken’s wayward husband, poet-filmmaker Willard Maas. Animals Running is one of the last works by Anne Severson, a feminist filmmaker who gained notoriety for her shockingly blunt, gynecological expose titled Near the Big Chakra (1971). “[A] serenely beautiful … study of animal life in continual movement—bees swarming, birds in flight, deer running… like a series of engravings come to life” (LA Times). Severson changed her name to Alice Anne Parker and is now Hawaii’s best-known psychic, having authored several popular books on dream interpretation. In Richter’s first sound film, the great Dadaist applies all his trademark techniques to the representation of a carnival spectacle. Plates are juggled, things are precariously balanced, a great he-man type struts across the stage and onto the ceiling. Reflections in distorted mirrors, slow-motion, freeze frames, negative printing, elaborate superimpositions, and fragmented bodies abound. Vintage footage of Stokely Carmichael delivering a powerful speech in Oakland on the occasion of a merger between the Student Non-Violent Coordinating Committee and the Black Panther Party, intercut with the performances of several dance troupes. It was also the birthday of Huey Newton, then being held for the shooting of a police officer. 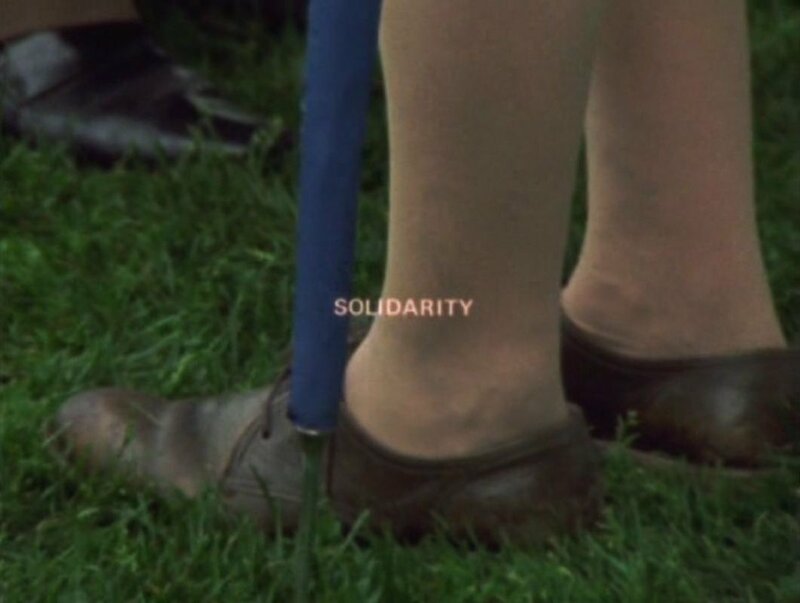 A documentation of female workers on strike at the Dare Cookie Factory in Kitchener, Ontario, in which nothing is seen but their shuffling feet. An organizer speaks in regard to the labor situation, and the word “solidarity” repeatedly flashes across the screen. In what appears to be standard surveillance footage of a shopping mall’s interior, a computer program proceeds to “tag” each individual patron as a numbered entity. Using motion tracking to follow them through a crowd, the program displays their entrance and exit times, purchase history and preferences, skin color, health statistics, and other details relevant to the perfection of consumerism. Documentation of an Apple desktop performance. Hundreds of icons are mercilessly copy-and-pasted, too many folders open at once, widgets proliferate, and no work is accomplished. A beautifully simple and concise meditation on gesture and repetition, using image feedback, luminance keying, and frame buffering to create the illusion of a monstrous, hundred-handed creature erupting from within the body’s interior.